Darling and I love travelling. We used to travel at least once a year before we had kids but slowed down the moment we became parents. These days, we still travel but our priority is the kids. Before deciding on a place to go, we make sure that the place we are heading to will have plenty of activities to keep the kids occupied. Comfort is also our top priority and that means having easy access to food, clean washrooms to freshen up and if possible we try to go to places that are not too hot so the kids stay cool and comfortable throughout our journey. With all those in mind, we chose to go up to Genting last weekend. With the weather getting really hot these days, it is a breath of fresh air to be up in the cool highland for a break. It is Ayden’s first time up there so we made sure it wasn’t just a day trip but got ourselves a room in Awana Genting for two nights so it won’t be too tiring for the little one. The highlight of our trip this time is the Ice Age Adventure 2014 happening at Genting International Convention Centre now until 26 October 2014. Ethan getting help with the wrist tag before the start of our adventure. As soon as we enter, there are many Ice Age movies backdrop lined up at the side and as we walked along them, we start reminiscing on each and every one of those movies. To jolt our memory further, we went into the Ice Age Theatre where they played short film followed by a fun Q&A session. My family in the cosy Ice Age Theatre. There are many bean bags around for us to sit or lie on while watching the short film. After watching the hilarious short film, there is a Question and Answer session. Ethan participated eagerly and tried his best to answer as many questions as possible because each correct answer entitles him to an Ice Age movie merchandise. Playing peek-a-boo. The boys enjoyed popping their heads out from the many ‘holes’ around. Ayden had a really fun time ‘surprising’ me by simply popping anywhere and seeing the surprised look on my face! LoL! Rotating Acorn. Ayden spent considerably a long time here rotating the acorn. He kept turning and turning it and never got bored. Next stop is the 3D picture station. This is where we let Ethan showcase his creativity by trying to get the best pose possible. He had fun making the 3D effect come to life. Ice Age Adventure 3D Picture. This is a very interesting backdrop. It actually creates a 3D pic if taken at the right angle. I think I got the angle correctly as the picture shows the ice floating on the flowing water. Ethan there is trying to steal the acorn from Scrat! Here we are in the pirate ship. I should have put my head at the pirate’s sword and act like a damsel in distress and get Darling to rescue me or something but ended up taking the least creative picture like the above instead. I did not see that idea earlier; only realised it now. Boo hoo. Ice Age Cave Drawing. We are actually in a maze here. After drawing a picture or two, Ethan kinda got lost in the maze. See. We are still in the maze. There are many mirrors to confuse you and Ethan like a true hero, lead us out of the maze. Hehe. Next stop is one of the most anticipated activity – Meet and Greet with Ice Age characters! Woo hoo! With Sid the sloth. Thank goodness Ayden is not at all afraid of these gigantic mascots. I super love this picture of Ethan and Sid. So cantik! There’s also Ice Age Mini Games where Ethan won a little dinosaur. Oh yes, before we leave, we get to redeem ice-creams using our ticket slip. 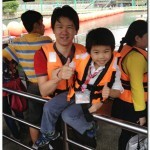 At only RM20 per person, we had a day full of fun with the kids. Who says spending time with the kids (especially in Genting) need to burn a hole in our pocket? Oh yeah, if you are a Genting Rewards member (like me), it is even better as Genting Rewards members can get the tickets at RM18 only. Ice Age Adventure 2014 is happening now from 1 September to 26 October 2014 at Genting International Convention Centre. Check out Genting’s website for more details. We had an ICE-traordinary fun time here at Ice Age Adventure 2014. Are any of you planning to bring your kids up? Do let me know as Ethan wants to go again! I also want to go and meet Sid! He is one of my favourite in the movie! What a fun event you had there. If you are planning to go there, do check out their “Behind The Scenes Tour” too. It suits Sam. She can decorate cupcakes, make sushi and more. This is such a good adventure for the whole family. I like how it involves Ayden too with the rotating acorn. Ethan has grown a lot, he looks much taller, a big brother to Ayden now. I must make time to watch Ice Age. To think I have not even watched a single one. Me bad. So cute la! The kids sure love this event! what a lotta fun this looks like. now i have an excuse to make a trip up to the mountains again. hehe. School Holiday Time…The kids sure happy. I loceng this movie !